Spacious. . . Especially with large dog. Very reliable. Comfortable on long distance trips. My problems are the electrical system and gas mileage. . Both not good. For a 12 year old car, I never worry about it starting or breaking down. I would rebuy this auto. Extremely spacious even when traveling with a large dog. It is very safe and comfortable. I trust that it is a reliable vehicle. I love my vehicle because I feel it is reliable and I can trust it to drive in the toughest conditions while enjoying a more luxury feeling. It has features that make it very comfortable such as the seats heating up. Also it is a nice size SUV that fits 7 people comfortably. 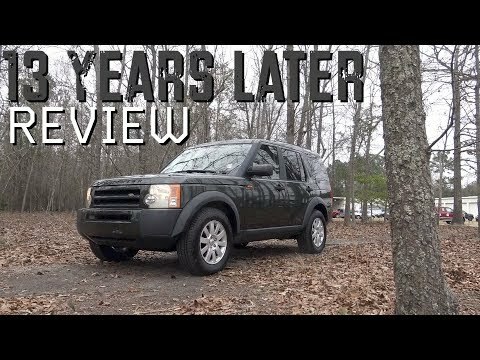 The lr3 is an incredible family car. Perfect car. No problems. Super safe and have two infant seats in back for grandchildren and still have room for another black person, a stroller, and luggage. Great on snow or rain. Drives off-road perfectly and all seats are heated including back seats. LAND ROVER IS RECALLING 37,142 MY 2005-2006 LR3 AND RANGE ROVER SPORT VEHICLES. RELATIVE MOTION BETWEEN THE STEERING WHEEL HUB AND/OR THE STEERING COLUMN COWL WITH THE CLOCKSPRING, WHICH INCLUDES THE DRIVER SIDE AIR BAG CIRCUITRY, COULD RESULT IN FRACTURING OF THE AIR BAG WIRING CONNECTION. IF AN AIR BAG WIRE FRACTURES, THE SRS WARNING LIGHT WILL ILLUMINATE ON THE INSTRUMENT CLUSTER. THE SRS WARNING LIGHT INDICATES TO THE DRIVER THAT THERE IS A CONCERN WITH THE SRS SYSTEM IN THE VEHICLE AND THAT IMMEDIATE REPAIR IS NECESSARY. IF THE SRS WARNING LIGHT IS IGNORED AND A VEHICLE CRASH OF SUFFICIENT SEVERITY TO COMMAND DEPLOYMENT OF THE DRIVER'S AIR BAG OCCURS, THE AIR BAG MODULE MAY NOT DEPLOY IN THE INTENDED MANNER. THE CONDITION MAY RESULT IN THE DEPLOYMENT OF ONLY ONE STAGE OF THE DUAL STAGE DRIVER'S AIR BAG OR THE AIR BAG MAY NOT DEPLOY AT ALL INCREASING THE RISK OF SERIOUS INJURIES TO THE DRIVER. DEALERS WILL INSERT 1MM SPACERS BETWEEN THE LOWER LEFT HAND SIDE OF THE COLUMN SWITCH MOUNTING POINT AND THE COLUMN LOCK TO IMPROVE THE ALIGNMENT OF THE COLUMN SWITCH. TWO FOAM PADS WILL ALSO BE FITTED TO THE TOP OF THE STEERING COLUMN SWITCH GEAR TO PROVIDE ASSURED CLEARANCE BETWEEN THE COWL AND THE CLOCKSPRING FACE. THE RECALL IS EXPECTED TO BEGIN ON OR ABOUT JULY 21, 2008. OWNERS MAY CONTACT LAND ROVER AT 1-800-637-6837. CERTAIN VEHICLES FAIL TO COMPLY WITH THE REQUIREMENTS OF FEDERAL MOTOR VEHICLE SAFETY STANDARD NO. 114, 'THEFT PROTECTION.' WHEN THE IGNITION IS SWITCHED OFF, AFTER A PERIOD OF TIME, IT IS POSSIBLE TO REMOVE THE IGNITION KEY WHEN THE TRANSMISSION SHIFT LEVER IS NOT IN PARK. THIS CONDITION INCREASES THE RISK OF A CRASH RESULTING FROM THE UNINTENDED MOVEMENT OF PARKED VEHICLES. DEALERS WILL REPROGRAM THE DRIVELINE CONTROL TRANSFER BOX ELECTRONIC CONTROL UNIT (ECU) WITH REVISED SOFTWARE. THE RECALL IS EXPECTED TO BEGIN DURING MAY 2006. OWNERS MAY CONTACT LAND ROVER AT 1-201-818-8500.